Regulation (EC) No 834/2007 and in particular Title III thereof lays down basic requirements with regard to aquaculture animal and seaweed production. Detailed rules for the implementation of these requirements should be laid down by amending Commission Regulation (EC) No 889/2008 (2), which lays down detailed rules for the implementation of Regulation (EC) No 834/2007. The Communication from the Commission to the Council and the European Parliament on a strategy for the sustainable development of European aquaculture (3) sets out a vision for the development of this sector over a ten year period to give a stable industry in rural and coastal areas providing alternatives to the fishing industry in terms of products and employment. The Communication pointed to the potential for organic aquaculture production and the requirement for norms and criteria to be developed. To ensure common understanding the definitions as laid down in Article 2 of Regulation (EC) No 889/2008 should be supplemented and corrected in order to avoid ambiguities and to guarantee the uniform application of the organic aquaculture animal and seaweed production rules. The aquatic growing area for organic seaweed and aquaculture animals is of utmost importance for growing both safe and high quality products with minimal impact on the aquatic environment. Community legislation on quality of waters and contaminants in food, including Directive 2000/60/EC of the European Parliament and of the Council of 23 October 2000 establishing a framework for Community action in the field of water policy (4), Directive 2008/56/EC of the European Parliament and of the Council of 17 June 2008 establishing a framework for community action in the field of marine environmental policy (Marine Strategy Framework Directive) (5), Commission Regulation (EC) No 1881/2006 of 19 December 2006 setting maximum levels for certain contaminants in foodstuffs (6), and Regulations (EC) No 852/2004 (7), (EC) No 853/2004 (8) and (EC) No 854/2004 (9) of the European Parliament and of the Council provide for environmental objectives for water and ensures high food quality. It is therefore appropriate to draw up a sustainable management plan for seaweed and aquaculture production specifying measures, such as waste reduction. Council Directive 85/337/EEC of 27 June 1985 on the assessment of the effects of certain public and private projects on the environment (10), Council Directive 92/43/EEC of 21 May 1992 on the conservation of natural habitats and of wild fauna and flora (11) and Council Directive 79/409/EEC of 2 April 1979 on the conservation of wild birds (12) should ensure proper interaction with the environment while taking into account the impact of these activities on the environmental objectives for water set out in application of Directives 2000/60/EC and 2008/56/EC. Provisions should be made for drawing up an environmental assessment covering best adaptation to the surrounding environment and mitigation of possible negative effects. There should be consideration that such assessments should ensure that organic production of seaweed and aquaculture animals which is a relative new activity in comparison with organic agriculture is not only environmentally acceptable, but relative to other options, most in accord with broad public interests and both environmentally suitable and sustainable. The specific soluble medium of water requires organic and non-organic aquaculture production units to be adequately separated; appropriate separation measures should be laid down. Given the variability of situations regarding both freshwater and marine environments throughout the Community it is preferable that adequate separation distances are set at Member States level, as Member States are best equipped to deal with separation given the heterogeneous nature of such aquatic environments. The cultivation of seaweed can have a beneficial effect in some respects such as nutrient removal and can facilitate polyculture. Care needs to be taken not to over-harvest wild seaweed beds to permit their regeneration and to ensure that production does not cause a significant impact on the state of the aquatic environment. Member States faces increasing shortages in the supply of organic protein crops. At the same time the imports of organic protein feed have been insufficient to meet requirements. The total cultivation area of organic protein crops is not large enough to meet the need for organic protein; therefore protein feed derived from parcels in their first year of conversion should be allowed to be fed under certain conditions. Given the early stage of organic aquaculture animal production organic broodstock is not available in sufficient quantities. Provision should be made for the introduction of non-organic broodstock and juveniles under certain conditions. Organic aquaculture animal production should ensure that species-specific needs of animals are met. In this regard husbandry practices, management systems and containment systems should satisfy the welfare needs of animals. Provisions on the appropriate construction of cages and net pens at sea as well as for rearing systems on land should be made. To minimise pests and parasites and for the reason of high animal welfare and health, maximum stocking densities should be laid down. Taking account of the broad variation of species with particular needs, specific provisions should be laid down. Recent technical development has led to increasing use of closed recirculation systems for aquaculture production, such systems depend on external input and high energy but permit reduction of waste discharges and prevention of escapes. Due to the principle that organic production should be as close as possible to nature the use of such systems should not be allowed for organic production until further knowledge is available. Exceptional use should be possible only for the specific production situation of hatcheries and nurseries. The overall principles for organic production, as provided for in Article 4 and 5 of Regulation (EC) No 834/2007, shall be based on an appropriate design and management of biological processes, based on ecological systems using natural resources which are internal to the system by methods that, in particular practice aquaculture complying with the principle of sustainable exploitation of fisheries. They provide also for the principle that the biodiversity of natural aquatic ecosystems has to be maintained in aquaculture production. These principles are otherwise based on risk assessment, and the use of precautionary and preventive measures, when appropriate. To this end, it should be clarified that artificial induction of the reproduction of aquaculture animals through hormones and hormones derivatives is incompatible with the concept of organic production and consumer perception of organic aquaculture products and that such substances should therefore not be used in organic aquaculture. Feed for aquaculture animals should meet the nutritional needs and is also required to meet the health requirement that feed coming from a species is not fed to the same species as laid down in Regulation (EC) No 999/2001 of the European Parliament and of the Council of 22 May 2001 laying down rules for the prevention, control and eradication of certain transmissible spongiform encephalopathies (13). It is therefore appropriate to lay down specific provisions for carnivorous and non-carnivorous aquaculture animals. The raw materials for feeding organic carnivorous fish and crustaceans should preferably be derived from sustainable exploitation of fisheries as referred to in Article 5(o) of Regulation (EC) No 834/2007 and defined in Article 3(e) of Council Regulation (EC) No 2371/2002 of 20 December 2002 on the conservation and sustainable exploitation of fisheries resources under the Common Fisheries Policy (14) or organic feed derived from organic aquaculture sources. Given the early stage of organic aquaculture and sustainable fisheries shortages of organic feed or feed from sustainable fisheries may occur, provisions should be made for the use of non-organic feed and be based on Regulation (EC) No 1774/2002 of the European Parliament and of the Council (15), which sets the health rules for material of fish origin which may be used in aquaculture and provides for a ban on the feeding of certain materials derived from farmed fish to farmed fish of the same species. For the purpose of organic aquaculture animal and seaweed production, the use of certain non-organic feed materials, feed additives and processing aids is allowed under well-defined conditions. New materials in question should be authorised according to Article 16(1) of Regulation (EC) No 834/2007. Based on the recommendation of an ad-hoc expert group (16) on ‘Fish feed and cleaning materials in organic aquaculture’ which concluded that such substances already listed in Annex V and Annex VI to Regulation (EC) No 889/2008 and authorised for organic livestock production should be allowed also for organic aquaculture and concluding that certain substances are essential for particular fish species, such substances should be added to Annex VI to that Regulation. The cultivation of filter feeding bivalve molluscs can have a beneficial effect on coastal water quality via the removal of nutrients and their use can also facilitate polyculture. Specific rules for molluscs should be laid down by taking into account that supplementary feeding is not required and that the environmental impact could be consequently lower than other branches of aquaculture in this respect. Animal health management should be primarily based on the prevention of disease. The measures provided for in this Regulation should be without prejudice to Council Directive 2006/88/EC of 24 October 2006 on animal health requirements for aquaculture animals and products thereof, and on the prevention and control of certain diseases in aquatic animals (17) in case of veterinary treatment. Certain substances for cleaning, antifouling treatment and disinfection of production equipment and facilities should be allowed under defined conditions. In the presence of live animals the use of disinfection substances requires particular care and measures to ensure that the application is not harmful. Such substances should be authorised according to Article 16(1) of Regulation (EC) No 834/2007. Based on the recommendation of an ad-hoc expert group such substances should be listed in the Annex. Specific rules for veterinary treatment should be laid down ranking the different types of treatments and limiting the frequency of use in the case of allopathic treatments. Precaution should be taken during the handling and transport of live fish so as to meet their physiological needs. The conversion to the organic production method requires the adaptation of all means to the organic method for a given period. Depending on the previous production systems specific conversion periods should be laid down. It appeared that certain Annexes of Regulation (EC) No 889/2007 contain mistakes; Provisions to correct these mistakes should be taken. Provisions for specific control requirements which take account of the specificities of aquaculture should be laid down. To facilitate the conversion of holdings already producing organically under national or private standards to the new Community rules certain transitional measures should be laid down. Organic aquaculture is a relatively new field of organic production compared to organic agriculture, where long experience exists at the farm level. Given consumers’ growing interest in organic aquaculture products further growth in the conversion of aquaculture units to organic production is likely. This will soon lead to increased experience and technical knowledge. Moreover, planned research is expected to result in new knowledge in particular on containment systems, the need of non-organic feed ingredients, or stocking densities for certain species. New knowledge and technical development, which would lead to an improvement in organic aquaculture, should be reflected in the production rules. Therefore provision should be made to review the present legislation with a view to modifying it where appropriate. to aquaculture animals other than those referred to in Article 25a. “locally grown species” in the framework of aquaculture and seaweed production, means those which are neither alien nor locally absent species under Council Regulation (EC) No 708/2007 (20). Those species listed in Annex IV of Regulation (EC) No 708/2007 may be considered as locally grown species. “stocking density” in the framework of aquaculture, means the live weight of animals per cubic metre of water at any time during the grow-out phase and in the case of flatfish and shrimp the weight per square metre of surface. This Chapter lays down detailed production rules for the collection and farming of seaweed. It applies mutatis mutandis to the production of all multi-cellular marine algae or phytoplankton and micro-algae for further use as feed for aquaculture animals. 1. Operations shall be situated in locations that are not subject to contamination by products or substances not authorised for organic production, or pollutants that would compromise the organic nature of the products. 2. Organic and non-organic production units shall be separated adequately. Such separation measures shall be based on the natural situation, separate water distribution systems, distances, the tidal flow, the upstream and the downstream location of the organic production unit. Member State authorities may designate locations or areas which they consider to be unsuitable for organic aquaculture or seaweed harvesting and may also set up minimum separation distances between organic and non-organic production units. Where minimum separation distances are set Member States shall provide this information to operators, other Member States and the Commission. 3. An environmental assessment proportionate to the production unit shall be required for all new operations applying for organic production and producing more than 20 tonnes of aquaculture products per year to ascertain the conditions of the production unit and its immediate environment and likely effects of its operation. The operator shall provide the environmental assessment to the control body or control authority. The content of the environmental assessment shall be based on Annex IV to Council Directive 85/337/EEC (21). If the unit has already been subject to an equivalent assessment, then its use shall be permitted for this purpose. 4. The operator shall provide a sustainable management plan proportionate to the production unit for aquaculture and seaweed harvesting. The plan shall be updated annually and shall detail the environmental effects of the operation, the environmental monitoring to be undertaken, and list measures to be taken to minimise negative impacts on the surrounding aquatic and terrestrial environments, including, where applicable, nutrient discharge into the environment per production cycle or per annum. The plan shall record the surveillance and repair of technical equipment. 5. Aquaculture and seaweed business operators shall by preference use renewable energy sources and re-cycle materials and shall draw up as part of the sustainable management plan a waste reduction schedule to be put in place at the commencement of operations. Where possible, the use of residual heat shall be limited to energy from renewable sources. 6. For seaweed harvesting a once-off biomass estimate shall be undertaken at the outset. 1. Documentary accounts shall be maintained in the unit or premises and shall enable the operator to identify and the control authority or control body to verify that the harvesters have supplied only wild seaweed produced in accordance with Regulation (EC) No 834/2007. 2. Harvesting shall be carried out in such a way that the amounts harvested do not cause a significant impact on the state of the aquatic environment. Measures shall be taken to ensure that seaweed can regenerate, such as harvest technique, minimum sizes, ages, reproductive cycles or size of remaining seaweed. 3. If seaweed is harvested from a shared or common harvest area, documentary evidence shall be available that the total harvest complies with this Regulation. 4. With respect to Article 73b(2)(b) and (c), these records must provide evidence of sustainable management and of no long-term impact on the harvesting areas. 1. Seaweed culture at sea shall only utilise nutrients naturally occurring in the environment, or from organic aquaculture animal production, preferably located nearby as part of a polyculture system. 2. In facilities on land where external nutrient sources are used the nutrient levels in the effluent water shall be verifiably the same, or lower, than the inflowing water. Only nutrients of plant or mineral origin and as listed in Annex I may be used. 3. Culture density or operational intensity shall be recorded and shall maintain the integrity of the aquatic environment by ensuring that the maximum quantity of seaweed which can be supported without negative effects on the environment is not exceeded. 4. Ropes and other equipment used for growing seaweed shall be re-used or recycled where possible. 1. Bio-fouling organisms shall be removed only by physical means or by hand and where appropriate returned to the sea at a distance from the farm. 2. Cleaning of equipment and facilities shall be carried out by physical or mechanical measures. Where this is not satisfactory only substances as listed in Annex VII, Section 2 may be used. This Chapter lays down detailed production rules for species of fish, crustaceans, echinoderms and molluscs as covered by Annex XIIIa. It applies mutatis mutandis to zooplankton, micro-crustaceans, rotifers, worms and other aquatic feed animals. 1. The provisions of Article 6b(1) to (5) shall apply to this Chapter. 2. Defensive and preventive measures taken against predators under Council Directive 92/43/EEC (22) and national rules shall be recorded in the sustainable management plan. 3. Verifiable coordination shall take place with the neighbouring operators in drawing up their management plans where applicable. 4. For aquaculture animal production in fishponds, tanks or raceways, farms shall be equipped with either natural-filter beds, settlement ponds, biological filters or mechanical filters to collect waste nutrients or use seaweeds and/or animals (bivalves and algae) which contribute to improving the quality of the effluent. Effluent monitoring shall be carried out at regular intervals where appropriate. 1. The competent authority may permit hatcheries and nurseries to rear both organic and non-organic juveniles in the same holding provided there is clear physical separation between the units and a separate water distribution system exists. 2. In case of grow-out production, the competent authority may permit organic and non-organic aquaculture animal production units on the same holding provided Article 6b(2) of this Regulation is complied with and where different production phases and different handling periods of the aquaculture animals are involved. 3. Operators shall keep documentary evidence of the use of provisions referred to in this Article. 1. Locally grown species shall be used and breeding shall aim to give strains which are more adapted to farming conditions, good health and good utilisation of feed resources. Documentary evidence of their origin and treatment shall be provided for the control body or control authority. 2. Species shall be chosen which can be farmed without causing significant damage to wild stocks. 1. For breeding purposes or for improving genetic stock and when organic aquaculture animals are not available, wild caught or non-organic aquaculture animals may be brought into a holding. Such animals shall be kept under organic management for at least three months before they may be used for breeding. 2. For on-growing purposes and when organic aquaculture juvenile animals are not available non-organic aquaculture juveniles may be brought into a holding. At least the latter two thirds of the duration of the production cycle shall be managed under organic management. 3. The maximum percentage of non-organic aquaculture juveniles introduced to the farm shall be: 80 % by 31 December 2011, 50 % by 31 December 2013 and 0 % by 31 December 2015. European glass eel, provided that an approved eel management plan is in place for the location and artificial reproduction of eel remains unsolved. in the case of carp the bottom shall be natural earth. 2. Stocking density is set out in Annex XIIIa by species or group of species. In considering the effects of stocking density on the welfare of farmed fish, the condition of the fish (such as fin damage, other injuries, growth rate, behaviour expressed and overall health) and the water quality shall be monitored. 3. The design and construction of aquatic containment systems shall provide flow rates and physiochemical parameters that safeguard the animals’ health and welfare and provide for their behavioural needs. 4. Containment systems shall be designed, located and operated to minimize the risk of escape incidents. 5. If fish or crustaceans escape, appropriate action must be taken to reduce the impact on the local ecosystem, including recapture, where appropriate. Documentary evidence shall be maintained. 1. Closed recirculation aquaculture animal production facilities are prohibited, with the exception of hatcheries and nurseries or for the production of species used for organic feed organisms. at least five percent of the perimeter (“land-water interface”) area shall have natural vegetation. shall have suitable cage design, construction and maintenance with regard to their exposure to the operating environment. 4. Artificial heating or cooling of water shall only be permitted in hatcheries and nurseries. Natural borehole water may be used to heat or cool water at all stages of production. 1. Handling of aquaculture animals shall be minimised, undertaken with the greatest care and proper equipment and protocols used to avoid stress and physical damage associated with handling procedures. Broodstock shall be handled in a manner to minimize physical damage and stress and under anaesthesia where appropriate. Grading operations shall be kept to a minimum and as required to ensure fish welfare. Abrupt changes in light intensity shall be avoided at the changeover time by the use of dimmable lights or background lighting. 3. Aeration is permitted to ensure animal welfare and health, under the condition that mechanical aerators are preferably powered by renewable energy sources. All such use is to be recorded in the aquaculture production record. in order to assure the survival of the farm stock. Documentary evidence shall be maintained. 5. Slaughter techniques shall render fish immediately unconscious and insensible to pain. Differences in harvesting sizes, species, and production sites must be taken into account when considering optimal slaughtering methods. The use of hormones and hormone derivates is prohibited. organic feed materials of plant origin and of animal origin as listed in Annex V and the restriction laid down therein are complied with. 2. If feed mentioned under paragraph 1 is not available, fishmeal and fish oil from non-organic aquaculture trimmings, or trimmings of fish caught for human consumption may be used for a transitional period until 31 December 2014. Such feed material shall not exceed 30 % of the daily ration. 3. The feed ration may comprise a maximum of 60 % organic plant products. 4. Astaxanthin derived primarily from organic sources, such as organic crustacean shells may be used in the feed ration for salmon and trout within the limit of their physiological needs. If organic sources are not available natural sources of astaxanthin (such as Phaffia yeast) may be used. 1. Aquaculture animals as referred to in Annex XIIIa, Section 6, Section 7 and Section 9 shall be fed with feed naturally available in ponds and lakes. 2. Where natural feed resources are not available in sufficient quantities as referred to in paragraph 1, organic feed of plant origin, preferably grown on the farm itself or seaweed may be used. Operators shall keep documentary evidence of the need to use additional feed. 3. Where natural feed is supplemented according to paragraph 2 the feed ration of species as mentioned in section 7 and of siamese catfish (Pangasius spp.) as mentioned in section 9 may comprise a maximum of 10 % fishmeal or fish oil derived from sustainable fisheries. 1. Feed materials of animal and mineral origin may be used in organic aquaculture, only if listed in Annex V.
2. Feed additives, certain products used in animal nutrition and processing aids may be used if listed in Annex VI and the restrictions laid down therein are complied with. 1. Bivalve mollusc farming may be carried out in the same area of water as organic finfish and seaweed farming in a polyculture system to be documented in the sustainable management plan. Bivalve molluscs may also be grown together with gastropod molluscs, such as periwinkles, in polyculture. 2. Organic bivalve mollusc production shall take place within areas delimited by posts, floats or other clear markers and shall, as appropriate, be restrained by net bags, cages or other man made means. 3. Organic shellfish farms shall minimise risks to species of conservation interest. If predator nets are used their design shall not permit diving birds to be harmed. natural settlement of shellfish seed on collectors. Records shall be kept of how, where and when wild seed was collected to allow traceability back to the collection area. However, seed from non-organic bivalve shellfish hatcheries may be introduced to the organic production units with the following maximum percentages: 80 % by 31 December 2011, 50 % by 31 December 2013 and 0 % by 31 December 2015. 2. For the cupped oyster, Crassostrea gigas, preference shall be given to stock which is selectively bred to reduce spawning in the wild. 1. Production shall use a stocking density not in excess of that used for non-organic shellfish in the locality. Sorting, thinning and stocking density adjustments shall be made according to the biomass and to ensure animal welfare and high product quality. 2. Biofouling organisms shall be removed by physical means or by hand and where appropriate returned to the sea away from shellfish farms. Shellfish may be treated once during the production cycle with a lime solution to control competing fouling organisms. 1. Cultivation on mussel ropes and other methods listed in Annex XIIIa, Section 8 may be eligible for organic production. 2. Bottom cultivation of molluscs is only permitted where no significant environmental impact is caused at the collection and growing sites. The evidence of minimal environmental impact shall be supported by a survey and report on the exploited area to be provided by the operator to the control body or control authority. The report shall be added as a separate chapter to the sustainable management plan. Cultivation in bags on trestles is permitted. These or other structures in which the oysters are contained shall be set out so as to avoid the formation of a total barrier along the shoreline. Stock shall be positioned carefully on the beds in relation to tidal flow to optimise production. Production shall meet the criteria listed in the Annex XIIIa, Section 8. 1. The animal health management plan in conformity with Article 9 of Directive 2006/88/EC shall detail biosecurity and disease prevention practices including a written agreement for health counselling, proportionate to the production unit, with qualified aquaculture animal health services who shall visit the farm at a frequency of not less than once per year and not less than once every two years in the case of bivalve shellfish. 2. Holding systems, equipment and utensils shall be properly cleaned and disinfected. Only products listed in Annex VII, Sections 2.1 to 2.2 may be used. during fallowing the cage or other structure used for aquaculture animal production is emptied, disinfected and left empty before being used again. 4. Where appropriate, uneaten fish-feed, faeces and dead animals shall be removed promptly to avoid any risk of significant environmental damage as regards water status quality, minimize disease risks, and to avoid attracting insects or rodents. 5. Ultraviolet light and ozone may be used only in hatcheries and nurseries. 6. For biological control of ectoparasites preference shall be given to the use of cleaner fish. substances such as: trace elements, metals, natural immunostimulants or authorised probiotics. 2. The use of allopathic treatments is limited to two courses of treatment per year, with the exception of vaccinations and compulsory eradication schemes. However, in the cases of a production cycle of less than a year a limit of one allopathic treatment applies. If the mentioned limits for allopathic treatments are exceeded the concerned aquaculture animals can not be sold as organic products. 3. The use of parasite treatments, not including compulsory control schemes operated by Member States, shall be limited to twice per year or once per year where the production cycle is less than 18 months. 4. The withdrawal period for allopathic veterinary treatments and parasite treatments according to paragraph 3 including treatments under compulsory control and eradication schemes shall be twice the legal withdrawal period as referred to in Article 11 of Directive 2001/82/EC or in a case in which this period in not specified 48 hours. 5. Whenever veterinary medicinal products are used, such use is to be declared to the control body or the control authority before the animals are marketed as organic. Treated stock shall be clearly identifiable. 1. If the final product is fresh seaweed, flushing of freshly harvested seaweed shall use seawater. If the final product is dehydrated seaweed, potable water may also be used for flushing. Salt may be used for removal of moisture. 1. Live fish shall be transported in suitable tanks with clean water which meets their physiological needs in terms of temperature and dissolved oxygen. 2. Before transport of organic fish and fish products, tanks shall be thoroughly cleaned, disinfected and rinsed. 3. Precautions shall be taken to reduce stress. During transport, the density shall not reach a level which is detrimental to the species. ‘2. 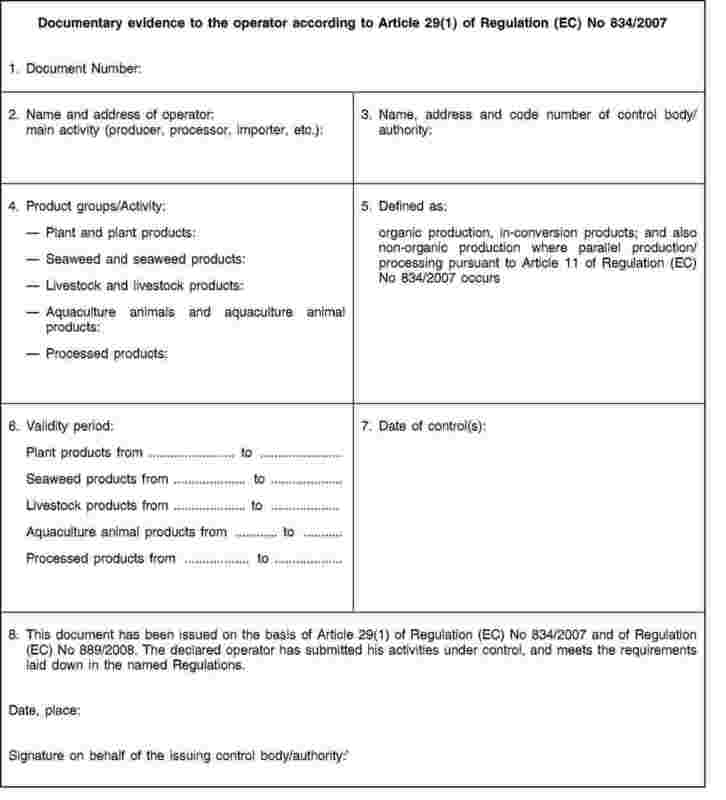 In case of organic plant, seaweed, livestock and aquaculture animal production units, storage of input products other than those authorised under this Regulation is prohibited in the production unit. 1. The conversion period for a seaweed harvesting site shall be six months. for open water facilities including those farming bivalve molluscs, a three month conversion period. for wild seaweed a full description and a map of shore and sea collection areas and land areas where post collection activities take place shall be drawn up. date of application, type and amount of fertiliser used. in the case of molluscs a summary of the special chapter of the sustainable management plan as required by Article 25q(2). disease prevention measures giving details of fallowing, cleaning and water treatment. For bivalve mollusc production inspection visits shall take place before and during maximum biomass production. ‘11. The competent authority may authorise for a period expiring on 1 July 2013, those aquaculture animal and seaweed production units which are established and produce under nationally accepted organic rules before entry into force of this Regulation, to keep their organic status while adapting to the rules of this Regulation, provided there is no undue pollution of the waters with substances not allowed in organic production. Operators benefiting from this measure shall notify the facilities, fishponds, cages or seaweed lots which are concerned to the competent authority’. The Annexes are amended in accordance with the Annex to this Regulation. point 4 of Article 1 shall apply the day of entry into force of this Regulation. corrective measures as provided for in point 19 of Article 1 and points 1(b) and (c) of the Annex shall apply from the entry into application of Regulation (EC) No 889/2008. This Regulation may be revised on the basis of relevant proposals from Member States, which are accompanied by a duly justified motivation, with a view of the modification of this Regulation from 1 July 2013. Done at Brussels, 5 August 2009. (2) OJ L 250, 18.9.2008, p. 1. (3) COM(2002) 511 of 19.9.2002. (5) OJ L 164, 25.6.2008, p. 19. (6) OJ L 364, 20.12.2006, p. 5. (7) OJ L 139, 30.4.2004, p. 1. (9) OJ L 139, 30.4.2004, p. 206. (10) OJ L 175, 5.7.1985, p. 40. (11) OJ L 206, 22.7.1992, p. 7. (12) OJ L 103, 25.4.1979, p. 1. (14) OJ L 358, 31.12.2002, p. 59. (15) OJ L 273, 10.10.2002, p. 1. (17) OJ L 328, 24.11.2006, p. 14. (18) OJ L 164, 25.6.2008, p. 19. (19) OJ L 327, 22.12.2000, p. 1. (22) OJ L 206, 22.7.1992, p. 7’. Products for cleaning and disinfection for aquaculture animals and seaweed production referred to in Articles 6e(2), 25s(2) and 29a. Ongrowing farm systems must be fed from open systems. The flow rate must ensure a minimum of 60 % oxygen saturation for stock and must ensure their comfort and the elimination of farming effluent. In open water containment systems (net pens/cages) with minimum sea current speed to provide optimum fish welfare or in open systems on land. Species concerned: Carp family (Cyprinidae) and other associated species in the context of polyculture, including perch, pike, catfish, coregonids, sturgeon. In fishponds which shall periodically be fully drained and in lakes. Lakes must be devoted exclusively to organic production, including the growing of crops on dry areas. The fishery capture area must be equipped with a clean water inlet and of a size to provide optimal comfort for the fish. The fish must be stored in clean water after harvest. Organic and mineral fertilisation of the ponds and lakes shall be carried out in compliance with Annex I to Regulation (EC) No 889/2008 with a maximum application of 20 kg Nitrogen/ha. Treatments involving synthetic chemicals for the control of hydrophytes and plant coverage present in production waters are prohibited. Areas of natural vegetation shall be maintained around inland water units as a buffer zone for external land areas not involved in the farming operation in accordance with the rules of organic aquaculture. For grow-out “polyculture” shall be used on condition that the criteria laid down in the present specifications for the other species of lakes fish are duly adhered to. The total production of species is limited to 1 500 kg of fish per hectare per year. Location to be in sterile clay areas to minimise environmental impact of pond construction. Ponds to be built with the natural pre-existing clay. Mangrove destruction is not permitted. Six months per pond, corresponding to the normal lifespan of a farmed shrimp. A minimum of half the broodstock shall be domesticated after three years operating The remainder is to be pathogen free wild broodstock originating from sustainable fisheries. A compulsory screening to be implemented on the first and second generation prior to introducing to the farm. Long-lines, rafts, bottom culture, net bags, cages, trays, lantern nets, bouchot poles and other containment systems. For mussel cultivation on rafts the number of drop-ropes shall not exceed one per square meter of surface area. The maximum drop-rope length shall not exceed 20 metres. Thinning-out of drop-ropes shall not take place during the production cycle, however sub-division of drop ropes shall be permitted without increasing stocking density at the outset.